While making a film in Japan, a French actress has an affair with a Japanese architect. As their relationship unfolds, the story of her life in occupied France as the lover of a German soldier, as well as her subsequent condemnation as a collaborator, is interwoven with his horrific experiences as a survivor of the atomic bombing of Hiroshima. Both are married, to all appearances happily so, yet they are drawn to each other in subtle, unspoken ways. Director Alain Resnais's images and screenwriter Marguerite Duras's words present the story in a series of searing flashbacks, brief vignettes that sometimes leave the viewer unsure whether the date is 1959 or 1945. This jumbling of time produces a sense of timelessness, of course, but it also impresses one with the contingent nature of reality and, most importantly, truth. The two lovers, knowing their relationship is fleeting, challenge and soothe each other in equal measure, so as to savor every moment they have together. Alain Resnais' Hiroshima Mon Amour has lost none of its poignancy and cuts so sharply to the truth about love and war that even after many viewings it is difficult to fully grasp the film's historical significance, storytelling innovations and stylistic brilliance. "You saw nothing at Hiroshima," the man (Eiji Okada) tells the actress (Emmanuelle Riva) who came to his homeland to make a film about peace. "He" and "She" have embarked on an affair and they talk. Speaking about their past and their countries, about hair and blood, shame and routine. The project was initially planned to be a documentary about the A-bomb. Marguerite Duras' transfixing screenplay transformed it into a love story. "Like you I forgot," the actress tells her Japanese lover, only to speak of the forgotten. Her dead German lover in Nevers is resurrected through this new impossible encounter as the third person singular shifts into second. The Japanese man, a married architect whose family died in Hiroshima, accepts the 'you' of her narrative as his. Church bells ring when her "dubious morals" lead deep into the heart caves of finding Nevers-land. Riva's luminous face makes us drown in her eyes. Images and sounds disjointed and in perfect disharmony, the nouveau roman a close relative, the opening sequence confronts us with shards of Hiroshima - the hospital, the museum with "human flesh suspended" in liquid, a Damian Hirst piece as if "still alive." Shattered stones and skin reconstructed and tourists crying, for "what else can tourists do?" Inadequate re-enactments of catastrophes on film serve Resnais to give a lesson in filmmaking. It doesn't work to build a set and re-stage the horror. It will never work, he seems to say, and he was right. News clips of the days after the A-bomb was dropped show the "temporary survivors." The discrepancy between the two kinds of footage speaks for itself without words. When rain causes panic and food causes fear, the invisible must be confronted. The length of Her hair marks the time. In 1943 it was long and blowing in the wind on her bicycle when she met the German soldier in barns and ruins and rooms. She was 18 and he 23. "That's when I almost lost you," the Japanese man says to the French woman. They have 16 hours left before her flight and the seven branches of the Ota delta flow into the Loire. Resnais and Duras go straight for the mnemonic cornerstones. The impossible love of a French girl in wartime for a German soldier - when did it turn into disgrace for her father? "In the cellar my mother tells me I am 20." The imprisonment out of shame is shown. The townspeople shave the girl's head with gentle smiles on their faces while holding paper scissors in their hands - body language contradicts the violent act. No mad angry mob follows her up the stairs, some even wipe the hair off her floral summer dress. These insincere gestures cut deeper than anything else he could have chosen to shoot. They had their scapegoat. "Are you ashamed for them, my love?" Now, frogs croak in the dark in Hiroshima. We see no monsters, only people, which makes it worse and more complicated. She leaves Nevers on her bike, alone and forever, sent off by her mother one August night in 1945 to arrive in Paris on the day that marked the world. Resnais, harrowed by history, managed to build a floating frame capturing the largest of the large in personal heartbreak. And then in the next moment he confronts us with our vanities. The man, a stranger, after one night spent together is disproportionately happy to be "the only one who knows" her story or whatever it is she told him. "I will remember you as the symbol of love's forgetfulness," should be seen in this context. Both know already that there will be other affairs to come and that it is goodbye for them - unless, one day - a war. "We'll go to Bavaria and get married," was an impossibility then, 14 years earlier, and during her last night in Hiroshima she walks from an Oasis to the train station into a taxi to a bar named Casablanca, where sounds of a river and an attentive stranger lure her to forget. The grey dawn over Hiroshima causes forgetting and being forgotten. Fully restored and being shown as part of the 52nd New York Film Festival, Resnais' debut feature celebrates its 55th anniversary during Duras' centenary year. A question asked often about classic masterpieces - how must it feel for someone to see this film for the first time now? With the Second World War as emotionally distant as the French Revolution for many Millennials, where will the ashes to ashes settle? The radioactive flower imprint on asphalt, shaped like mangled barbed wire and the glistening bodies - statues of cinders and history in an embrace we don't yet know - will the associations only remain with the people covered in the collapsed World Trade Center Towers' debris? The French/Japanese co-production originally had Chris Marker involved, who dropped out and is still winking at us from the eyes of three cats, two white ones in Hiroshima and a black one in Nevers in a cellar damp from the nearby empty banks of the Loire. Two towns forever linked by a river and a war in Hiroshima Mon Amour. - Anne-Katrin Titze, Eye For Film, 08 September 2014. The recent excellent 4K restoration of the film, was supervised by cinematographer Renato Berta and completed by Argos Films, Technicolor and Groupama Gan Foundations, and Cineteca di Bologna in 2013. It is quite possibly one of the best restorations of a classic black-and-white film to come out of France. The film blends two entirely different visual styles - it was lensed by two different cinematographers, Sacha Vierny and Takahashi Michio - and as a result there are some obvious shifts in terms of definition, clarity, and depth. The documentary footage looks appropriately rough and quite uneven. There are scratches, splices, cuts and damage marks. Density fluctuations are common as well. The fictional footage looks fantastic. Detail and clarity are enormously impressive. This is a film with a very delicate light/shadow balance. The new restoration has effectively balanced the delicate intimate sequences where light is carefully captured by the camera to convey very specific feelings and emotions. Grain is evenly distributed and well resolved throughout the entire film. The audio has also been remastered. While dynamic intensity remains quite modest, the narration and dialog are full and rounded. Clarity and depth are very good. The melancholic music score also easily breathes throughout the entire film. There are no pops, audio dropouts, background hiss, or digital distortions. 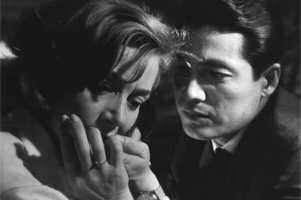 This is an outstanding restoration of Hiroshima mon amour that has literally given the film a new life. - adapted from Dr. Svet Atanasov, Blu-ray.com, 22 June 2015.